Copyright (c) – EMI Records Ltd. Manufactured By – EMI Records Ltd. Printed By – James Upton Ltd.
℗ 1988 Original sound recordings made by EMI Records Ltd.
© 1988 EMI Records Ltd.
Sleeve printed in England. Manufactured in England. Published by Chappell Music Ltd. Credits and Mark Hollis' handwritten lyrics are printed on the inner sleeve. A1 to A3 is a continuous track. RIP Mark, a true genius! A huge loss! Wonderful songwriter and what a voice! This and Laughing Stock have changed my life. Talk Talk and Mark Hollis' solo album are so unique, intense yet minimalistic, haunting... I cannot find any words that would do justice to these masterpieces. What happened to the drummer Lee Harris, he was a fierce ball of energy on Talk Talk's first couple of albums, but here he is just plodding along, as witnessed on "The Rainbow" hitting the snare like a metronome on downers (every fourth beat). Everything you ever want from music. A big than you to everyone involved. It is a true masterpiece. Spirit Of Eden and Laughing Stock could well be the two greatest albums of all time. I don't need to say any more, and I don't need to justify that statement, as the proof is in the listening. Just wondered if anybody else had ever come across a 12" white label pressing of "Desire" from Spirit of Eden or whether I have just imagined the whole thing ? As I recall it was in a typical die cut black sleeve without any writing on it but I've no idea if it was single sided or not. I shouldn't be admitting to this but I actually left it in favour of a copy of Lou Reed's Coney Island baby album ! Oh well, at least I got it signed later on so it must be worth at least a couple of quid to someone, somewhere in summertime ! Any Reed fans who might be interested ?! 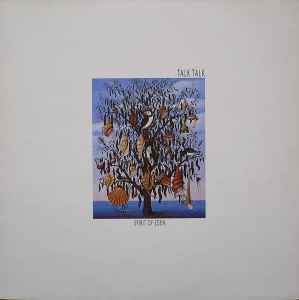 "Spirit of Eden", the first of the epochal final two albums from Talk Talk, showcases a band (or more accurately, two dozen or so very talented people) reaching the absolute heights of musical creativity and pure song-craft. Both are singular masterpieces, but while 1991's essential "Laughing Stock" twists and turns through fragmented, deconstructed arrangements, 1989's "Spirit of Eden" reveals a series of six lush, flawlessly composed songs that have few peers among nominally "pop/rock" albums. "Spirit of Eden" is often lazily and somewhat accurately tagged as "post-rock" but two words and a hyphen don't really do them justice-- look, for example, at how uncannily "Spirit of Eden" predicts (and equals) celebrated efforts from art-rock institutions like Spiritualized, Sigur Ros and Radiohead, despite being recorded and released a decade earlier. Mark Hollis' unbelievably dynamic vocal performances are masterpieces unto themselves, as are so many of the album's details, particularly the otherwordly organ tones that producer/multi-instrumentalist/all-around-genius Tim Friese-Greene conjures across the album. I'm not a religious man, but the transcendently gorgeous organ arrangements on album closer "Wealth" might even justify use the word "spiritual" without any of the usual eye-rolling. An undisputed classic! And the phenomenal-sounding 2012 vinyl reissue cannot be recommended highly enough. My goodness this sounds superb on vinyl (original UK edition), just exquisite. Really good pressing, looks like a "classical" record. I've owned the '88 and '97 CD editions and they're adequate but this is much nicer. yes, there are bootlegs floating around, as this_is_a_document has noted. be careful! beyond that, this is one of the best records i have ever heard. the follow-up, laughing stock, is just as good. also worth owning is mark hollis' solo album, which is mined from the same musical terrain as spirit of eden and laughing stock.